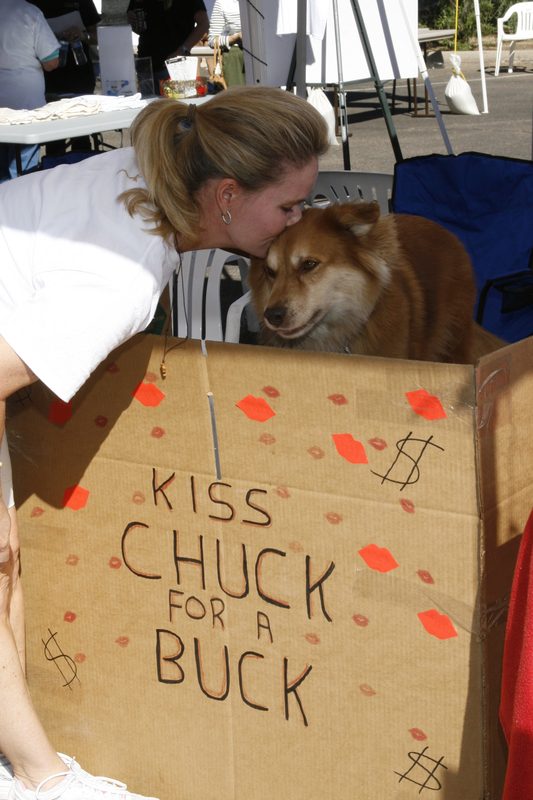 And this was his fund-raising booth for the Chuck Waggin' Pet Food Pantry (a division of PACC911). I lost several dollars to Chuck. I couldn't stay away. But he didn't mind. His brown eyes and his soft touch melted my heart. This photo was taken by Carolyn of Easel Photography in Mesa AZ. Carolyn and Candy were the official event photographers at the St. Francis Festival at the Franciscan Renewal Center in Scottsdale AZ. It didn't take much convincing to have them focus on Chuck here. He clearly stole the show. These two ladies took tons of wonderful photos for this event. Click on the link above to get to their website and then on EVENTS to find the St. Francis Festival images! There were many adorable animals in which to fixate. I lost count. But Chuck was clearly special to me. So patient and tolerant. So handsome and sweet. Sigh. I bet even the cats could like this one. Dare I even think it?!? All for now. I just want to stare at Chuck and remember his soft fur on my cheek. Meet the subject of one of my most popular pet portraits, Rusty! PACC911 (Phoenix Animal Care Coalition) and the Franciscan Renewal Center (The Casa) joined together again this October for a wonderful pet adoption event. Every year, this weekend offers numerous animal adoptions, pet blessings by the Franciscan friars, gifts and souvenirs, micro-chipping, food and beverages, and just a great reason to get out and enjoy this beautiful Arizona weather. This year, there was even a kissing booth! But I will wait to tell more once I am able to post some incriminating photos. Mike Slivers at The Casa was the man in charge. He did an outstanding job. I was asked to design the event logo and tshirts. It was an honor to help represent this special time with a graphic depiction using four of my portraits. The negative space between the four images created the sign of the cross. It was a meaningful visual that combined both the spirituality of St. Francis and The Casa and the objective of helping many beautiful creatures find their forever homes. I also created a special St. Francis medal, packaged with a prayer card. The medal was for both pets and their people. We are all creatures of one family! Both the tshirts and the medals made special souvenirs for those in attendance. I had a display booth with my paintings. 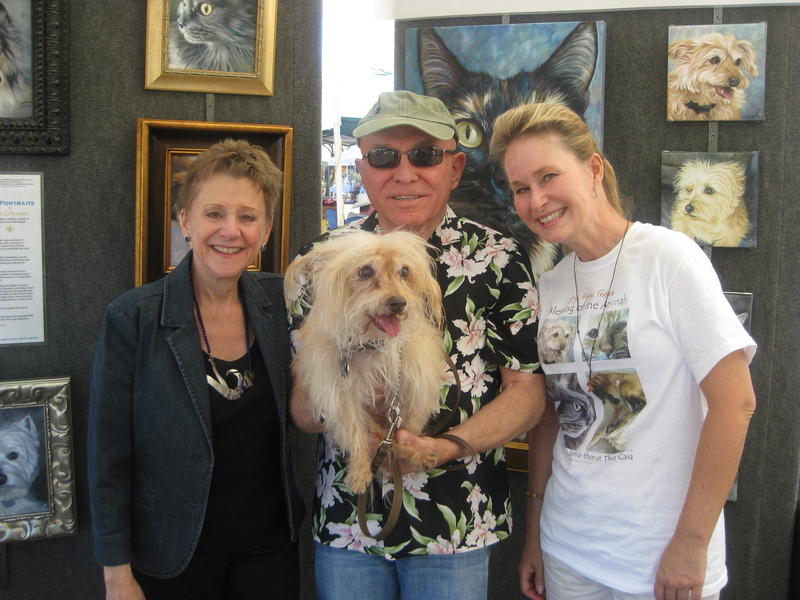 Many of my clients attended and brought their fur kids in for blessings. 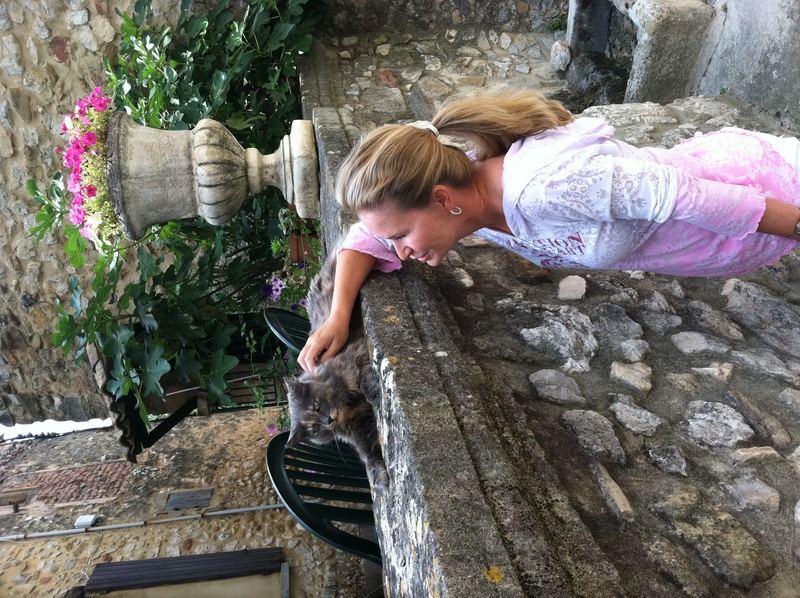 Shown here are two of the most compassionate pet owners I've ever known and loved. They brought their little Rusty, who is a celebrity unto his own. Rusty was featured on the tshirt and you can see his portrait (from a year ago) on the display at the upper right corner. All in all, this was a wonderful time with many special moments. I just wish all the animals had found their forever homes. It is so difficult to see so many sweet animals without their own family. Please adopt, if you can. And if you cannot, please help as you can. Donate, volunteer, advocate. It's all good. The creatures of this world rely on us to be good stewards of the earth. It is in giving that we truly receive. PALS – Pets & Animal Lovers Service serves a special role. When our beloved pets make their transition, PALS is the best place to go for their reliable cremation. My friend Katherine has been doing this business for years and is among the most reputable in the country. Together, we have decided to offer an exclusive: wooden pet urns with a painted portrait in oils of your pet by Lisa LaTourette. The urns come in various sizes and are quality wooden construction with two finishes in which to choose. 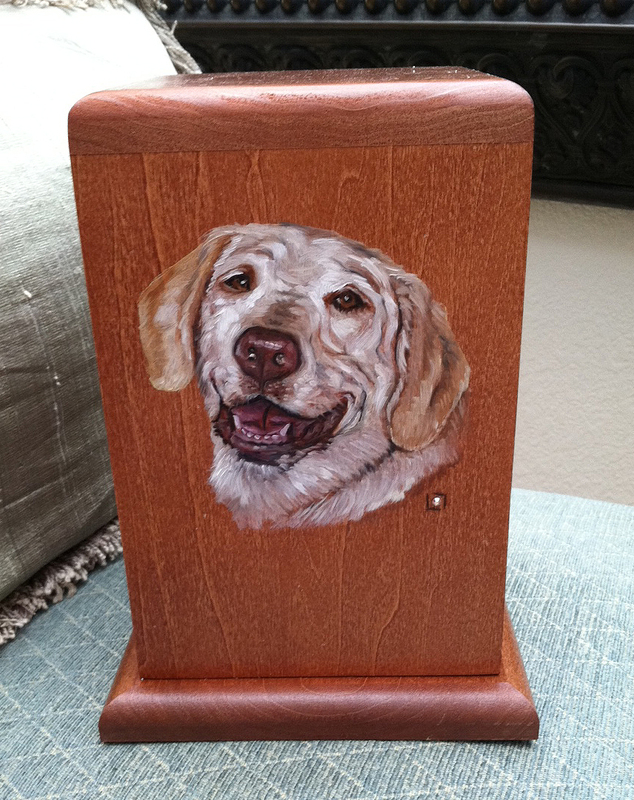 Cats, dogs, birds, horses and pretty much any creature can be memorialized with their likeness on the urn. My trademark signature initials with a Swarovski crystal is included, just like the larger portrait commissions in which I am known to do. The crystal is in tribute to the animal, who was a unique spark of light and life in this world. A beautiful likeness will be painted on the urn itself, creating a precious memorial for your beloved pet. To view the urn options online, go to www.ourpals.com and click on the URNS button at the top right side. That will take you to a page with many choices of quality urns. 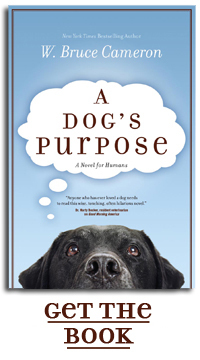 While the topic of a pet leaving us and this earth is sensitive, the idea of commemorating their life and meaning to us as pet owners can be comforting. Please feel free to share this information with friends or family who would value this special service. Imagine turning away 121 animals a day. They can’t and they won’t with Project 121. 121 represents the average number of animals Arizona Humane Society (AHS) takes in on a given day. Summertime is especially critical with prolific litters and outdoor temperatures escalating the need. It is a monumental task to provide ongoing medical, rehabilitative, shelter and adoptive services for 121 new arrivals daily, especially considering AHS receives no federal or state funding. Initiatives such as Project 121 are critical to the survival of the animals who rely on the AHS: private donations to care for the 46,000 animals AHS serves annually. Please help to make a difference in the life of an animal – take action today. The folks who dedicate their time and resources to this wonderful agency are a tireless crowd with hearts of gold. They cannot handle this situation without additional help from people like you and me. Open your hearts, checkbooks, daytimers and pie holes and do what you can. I think we all agree that it is in giving that we receive. Adopt if you can. Donate if you can. Volunteer if you can. Advocate the health and well being of animals if you can. YOU CAN make a difference in the world! When I saw the first advertisement for Project 121, I didn’t know what it was about. I saw the second one and I still didn’t understand. So I looked it up on their website. It was then very clear: THEY SIMPLY NEED OUR HELP! So I thought I would help spread the word and hopefully gain some needed outreach into my network here. We are in an unprecedented time where people are seriously being called upon to help others in need. Furry or otherwise. Lend a hand and support this wonderful place. One of my favorite places is the Franciscan Renewal Center on Lincoln Drive in Scottsdale. The grounds are beautiful and inspiring. The community is welcoming and kind. A few Sundays ago, I had a special experience. Walking in the healing garden with my friend Betty Dean, we stopped for a moment to take in the beauty of the morning. As I looked at nature around us, I realized that I was seeing something unusual in the design of the bark in one of the trees. It was St. Francis! My eyes must have bugged out of my head. Betty quickly looked and saw what I was seeing. We stood for a moment both without words. I ask you to embrace Brother Wolf and his Kind and to give so tame and gentle a creature his daily bread and a place near the hearth. If you do this, I give you the Lord's promise of peace. Visit The Casa (the Franciscan Renewal Center) and see this place for yourself. I am so lucky to be a part of this community. And lucky to be able to see St. Francis in the tree. 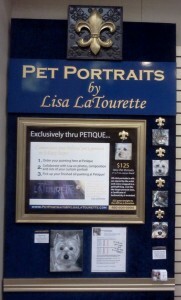 The Arizona Humane Society's (AHS) retail store, Petique, is offering an exclusive of mine. I am doing mini pet portraits, which are only 4" x 4". But they pack a lot into a little area! These mini's come finished in a gold gift bag with my same Certificate of Authenticity. Because space is so limited, my signature is simply my two initials: double L's with the trademark crystal placed in between. Petique is at the Biltmore Fashion Park at Camelback Road and 24th Street in Phoenix. The shop is located at the most eastern part of the mall near the end. For each mini that is sold, $25 will go directly to the Arizona Humane Society as a donation. Besides being a great place to find giftables for pets and their families, Petique also brings animals from the AHS shelters for adoption. You can visit with dogs, cats and other animals who are wanting to find their forever home. In all likelihood, some furry person may want to adopt you! Visit Petique. Tell your friends about this wonderful place. And please support the Arizona Humane Society!